Communication methods have evolved with technology, and as a result, the traditional shopper path to purchase has changed. 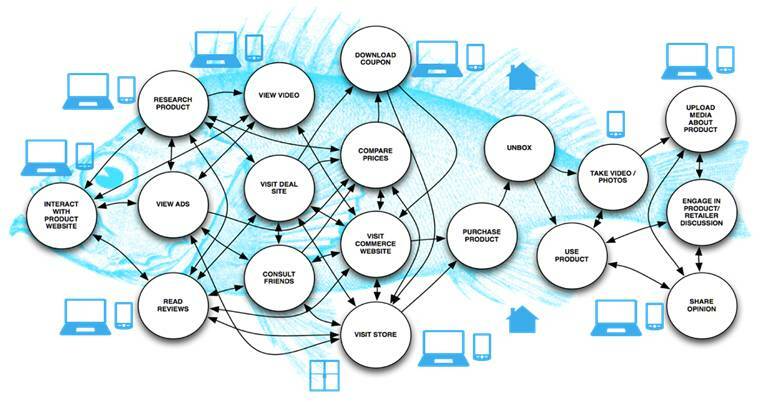 Kantar Retail published this diagram of the “Path to Purchase Fish” – a modern take on how shoppers interact with a brand before purchasing a product. It’s a great depiction of just how complicated it is for each shopper to get from the first touchpoint to making a purchase. While this diagram shows the many methods that can be used to move a shopper from one stage to the next, we believe that these actions can still be condensed into the traditional path to purchase. What is changing is how these new methods for communication are impacting the pace of awareness to purchase. Influencers, for example, might be impacting the consideration stage when they create marketing content for brands. Marketers activate influencer campaigns for PR but they’re getting so much more than product exposure. 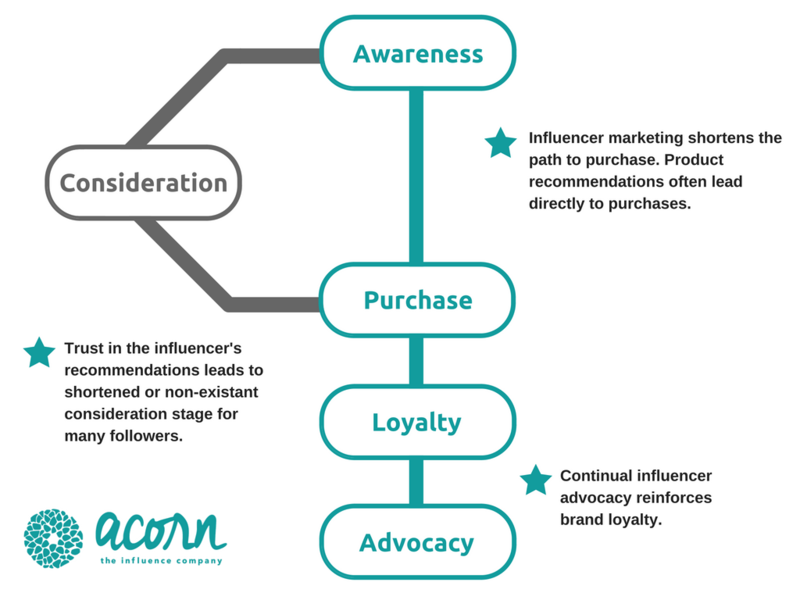 Influencer campaigns accelerate shoppers from awareness through to the purchasing stage, skipping or shortening the consideration stage. Unlike a paid banner ad influencer’s participation in a campaign is viewed as an authentic endorsement. Influencers attract long-term customers because their audience are already engaged with the topic that an influencer specifies in writing about. The audience of influencers with smaller followings are more likely to share mutual interests with the influencer, and with each other, than a larger audience of millions. The blogger often interacts with individuals in the comments of their content, and a friend-like relationship is built. The audience trusts the bloggers opinion. This trust leads to a shortened or nonexistent consideration stage because the influencer has done all the work for them. The influencer’s endorsement acts as instant approval for the product, and brand. Thanks to the targeted audience of these bloggers, and social media advocates, the brands are seeing a boost in advocacy for their products. This is because their audience is the same target shopper brands are trying to reach in their traditional marketing campaigns. Influencer marketing just does it more efficiently. Will This New Path To Purchase Last? Influencer marketing methods are relatively new and more brands than ever before are using them to boost campaign results. Will this new path to purchase last? Yes for the foreseeable future bloggers, and social media advocates, have the power to greatly influence shoppers in the purchasing decision process. According a recent study, influencer marketing generates 11x greater ROI than traditional advertising efforts.